Posted on January 27, 2016 by Hillary T.
Juried by Amy Montague, the Director of the Museum of American Bird Art at Mass Audubon, the exhibition features multimedia artwork that celebrates the songs, vivid colors and enormous variety of bird species attracted to Cape Ann’s coastal waters, marshes, and waterways often bring with them both birding enthusiasts and artists, each drawn by their vibrant visual appeal. 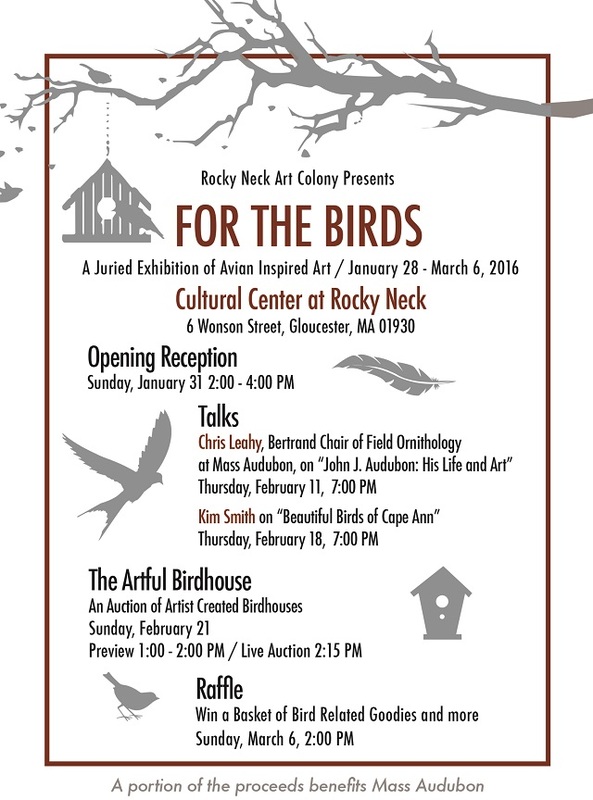 All of the events will take place at the Cultural Center at Rocky Neck, 6 Wonson Street, Gloucester, MA. This entry was posted in Special Events on January 27, 2016 by Hillary T..